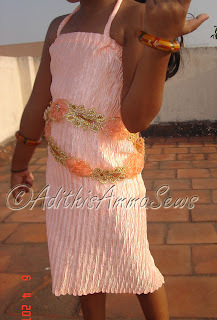 Adithis Amma Sews - Cute Confessions of a Sew Addict: Quick Fire Party Dress ! Quick Fire Party Dress ! There is a Birthday Day of 1 year old Cutie Trishanth in our colony. My DD is excited about having a fun at the party. I realised that i had not sewn any new outfit for her recently and this was just the right 'excuse' to indulge! 5 Easy steps were all it took to create this Party Dress ! Stitched the seam leaving about 3 inches open at the bottom to function as vent for ease of movement. Added 2 noodle straps to hold her in modesty! 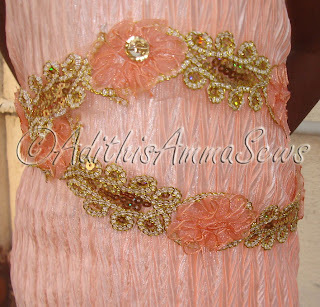 To add a bit of 'zing' to the outfit attached the trim . Party Dress is Ready to Rock and so is she !!! CLICK ON READ MORE TO VIEW MORE SASSY SNAPS AND DETAILS ! Hot new party dress is ready in a jiffy. I had a tough time convincing her to take off the dress as she insisted she wears it today itself and goes out to play! Somehow managed to convince her saying party is just another day away! 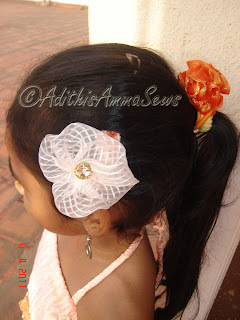 Finally she agreed to it as we wanted to flaunt it at the party! Matching Hair Clip to boot! Square piece of fabric which turned into party dress! left over material to lovely party dress. 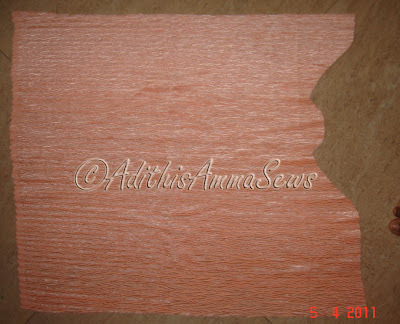 Another beautiful creation! And your daughter is precious! I'm sure she was so excited to wear such a lovely dress to the party. Very pretty and simple too. I think the fabric you started with was a great choice. Thanks for sharing at Beyond The Picket Fence. Hey mama, I know you already saw I featured you, THANKS for the sweet comment. I love featuring all you wonderful blogs, it's so much fun seeing all the awesome projects. I love this beautiful dress, and love how simple it is, yet so fancy, and clearly perfect for the special occasion. Your daughter looks like she loves her new dress.